There are numerous resources on the Internet that give guidance on the tying and use of different knots. 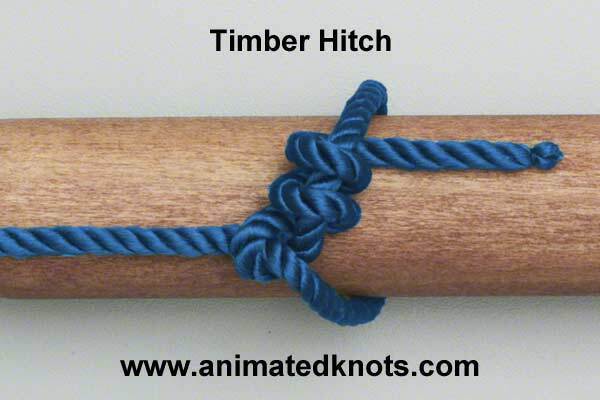 I have found the Animated Knots website and YouTube channel particularly useful. The table below shows some of the most common knots and examples of how they might be used in forest school. There are also lots of different guides available on the Internet that can be printed and laminated and taken to the woods. The Scouts Simple Knots guide I have found useful. For younger children knots use can be supported by use of a story. Using thicker rope and larger pieces of wood can be useful both when demonstrating to a group and for learners to practise with. Quality thick rope is generally very expensive. Lot’s of the bargain stores sell cheap rope that is a reasonable diameter. It’s completely useless for supporting any weight but ideal for teaching rope use. The animated knots below are great if you’re sat in front of the computer but not so much use in the forest. Taking photos of each step of tying a knot and then printing and laminating them is an easy way to support learning, especially for visual learners. Combining knot tying with activities requires learners to ties the same knot several times and reinforces learning. A star made from sticks for example would require five knots to create. We made mini rafts during my portfolio sessions and learners had to ties multiple square lashings to build them. Activities taking place periodically over time that involve use of the same knot will support fully embedding the learning. Teaching the knot to one learner or one group and asking them to rotate and show each other how to tie the different knots is an effective way to encourage and support peer learning. 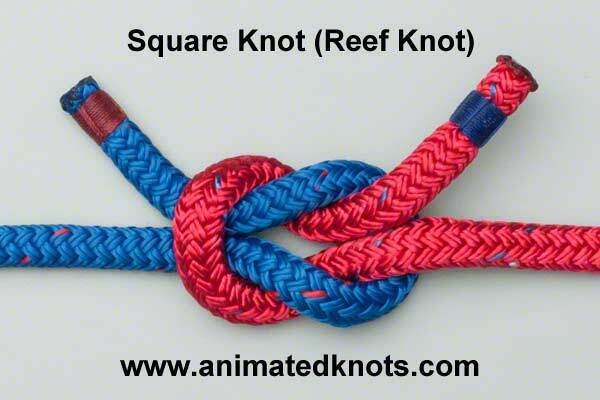 Reef knot The reef knot is a very simple binding knot. It is familiar to many people and often used to join two pieces of rope or cordage though can be insecure and slip. Teaching of this knot is often accompanied with the mnemonic ‘left over right, right over left’. In forest school the reef knot is a good knot to use to introduce knot tying to children. It is easy to learn and likely familiar as it is essentially the same knot used to tie shoelaces. It can be used to secure bundles of sticks or other objects. It should not be used to bear weight or if subject to movement as it may fail. 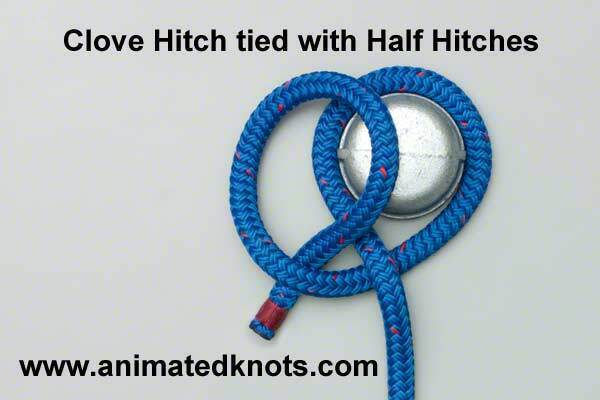 Half hitch A very simple knot where the end of the cord is brought over and under the standing line. It is insecure on it’s own but often an element in other knots such as the clove hitch or round turn and two half hitches. 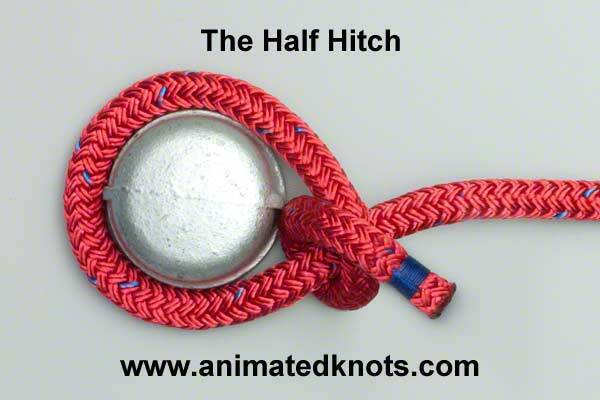 In forest school a half hitch is another simple introductory knot and a useful one to know as it is part of other common knots. Practically a half hitch can be used to temporarily secure a line to an object. Clove hitch The clove hitch is a very common knot used to secure a line around an object. It can be created by tying two half hitches. If tying to a bollard or post it can also be tied using loops. Another simple knot to teach to children. The clove hitch is often used as the start and end of lashings. It is a good all purpose knot that is easy to tie and easy to release. A clove hitch is useful when setting shelters as it is easy to loosen and adjust the tension. Timber hitch Used for pulling cargo, particularly logs, either on water or land. The timber hitch is quick and easy to tie and hold secure when under load but is very easy to untie. In forest school the timber hitch can be used for moving large logs. Tying one at each end of the log will give more control over the movement and direction of the log and allow the log to be moved by more than one person at a time. Round turn and two half hitches Useful for securing an item to a post of ring and is often used in boating. 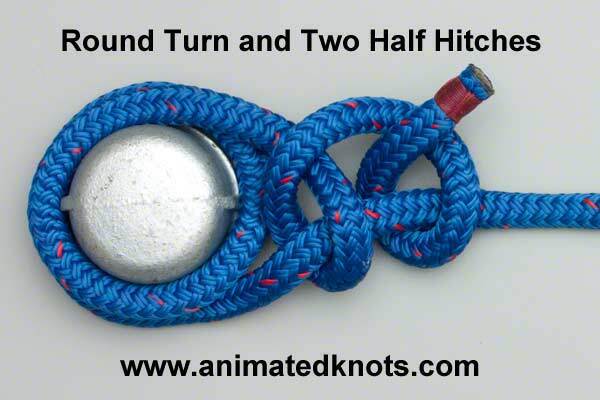 We live on a boat and the round turn and two half hitches has been my go to knot for mooring the boat for years. Additional half hitches can be added to make the knot more secure or to use up excess line. In forest school this knot can be used for securing shelter lines. It is also a useful know to use with tree climbing, aerial ropes or rope swings. It is easy to tie and under pressure will not slip. 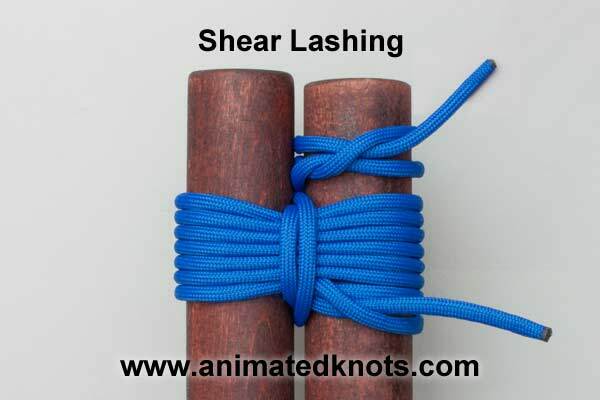 Shear lashing A shear lashing is used to lash two poles together to set of legs. A clove hitch is often used to start and end the lashing. 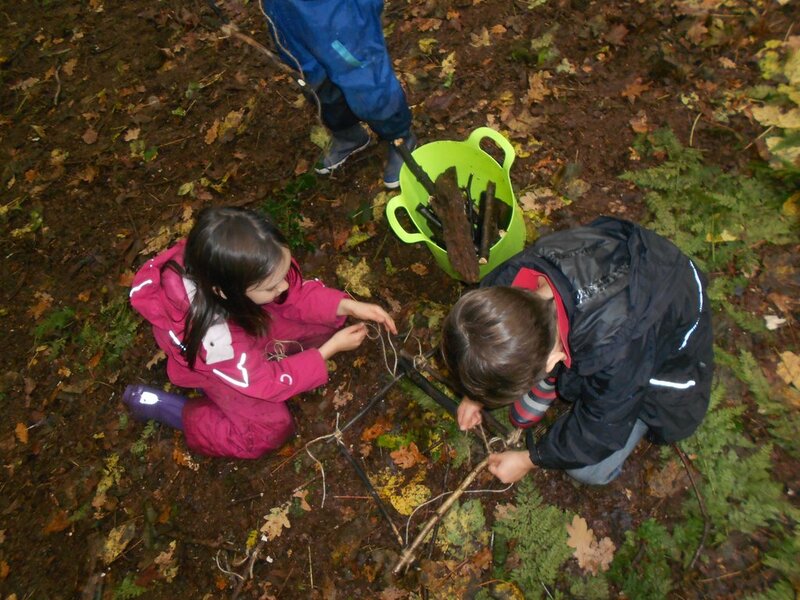 In forest school shear lashings can be used, with a pole lashed between the legs, to form an A-frame. A-frames can used for a variety of purposes such as forming part of a shelter. 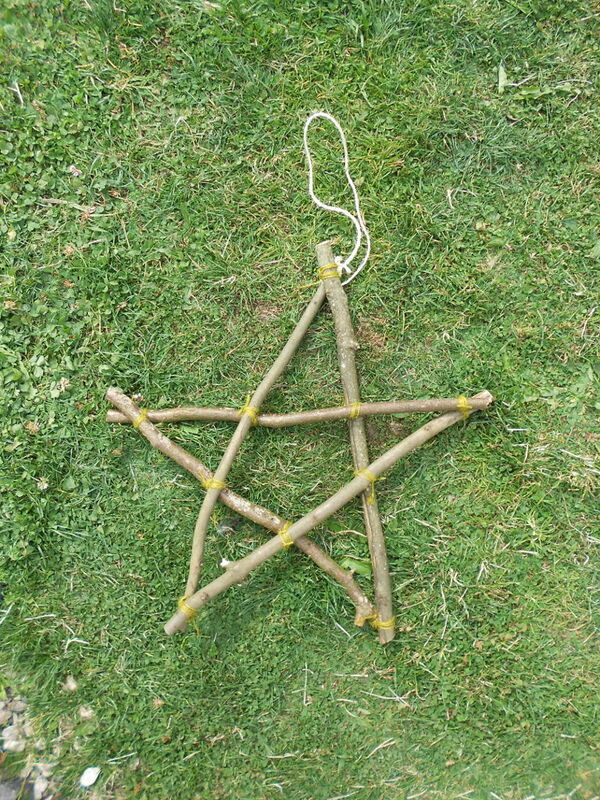 Shear lashings can also be used in craft activities such as the twig star below. 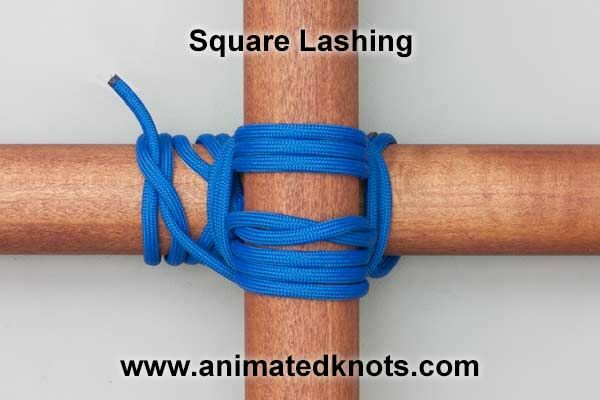 A square lashing is uses to lash two poles together at an angle, usually 90 degrees. A clove hitch is often used to start and end this lashing. In forest school square lashings can be used to build frames for furniture items such as tables, wash stands and tool racks. Children using square lashings to make a frame for a raft for their little people.